The Marmot Nano is the lightest Gore-Tex shell I've seen to date. Made of Gore's top-drawer PacLite fabric, the impressive Nano offers perhaps the best combination of weight, waterproofness, and breathability at any price. Gore-Tex shells as a rule seem to clock in around sixteen ounces, with the lightest models pushing toward eleven. The Nano weighs in at a best-of-show 8.4 ounces (men's medium; measured), making its only real competition the North Face's HyVent Triumph Anorak. Compared to the Triumph, the Nano screams high-end. It looks and feels better, fits better, and has a significantly nicer hood (with a shapeable brim). Marmot's sizing matches my medium but slender frame quite nicely, making it seem as though the jacket was custom tailored. About the only thing I don't like about the Nano is its zippers, which tend to stick—not because they catch fabric, but rather because they form such tight seals. Generally speaking, when new shells arrive at my house they tend to end up on ebay not much later. The Nano therefore earns the unique distinction of traveling directly to my gear bag, where it currently sits. This one, for me, is a keeper. I can't offer objective data comparing the windproofness, waterproofness, and breathability of the Nano's Paclite fabric versus North Face's HyVent. But my strong sense is that the Nano is significantly more breathable. Windproofness seems more like a tie to me. Waterproofness with either shell should be excellent. I don't believe claims that either HyVent or PacLite fail in heavy rain. More likely, people confuse dampness from sweat or vapor on the interior in abominable weather as leakage. Again subjectively, the Nano's PacLite fabric has the better feel compared to HyVent. It is more comfortable against the skin, crinkling less, compressing better—generally it seems more like a natural rather than synthetic fiber. I would call the Nano a Venture-jacket killer were it not for the considerable price difference between the two. Price puts the Nano jacket into the high-end category, to be sure. Since the Triumph Jacket remains a full two ounces lighter, the Nano will not entirely replace the Triumph when I go climbing or skiing. But, where those two ounces don't matter, I think the Nano easily gets the nod. 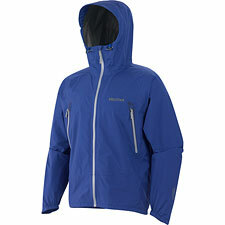 And if you're a Gore-Tex afficianado, this is a no-brainer: a handsome, well-made, ultralight shell from Marmot.